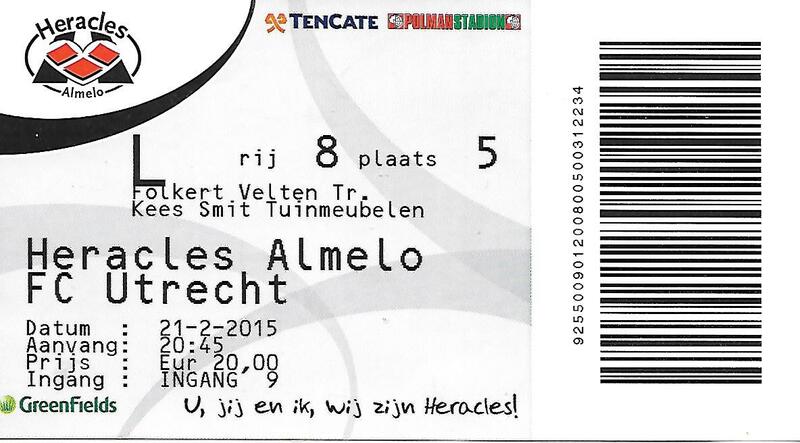 The formation of Heracles Almelo dates to 1902 when a club called Hollandia came into being. 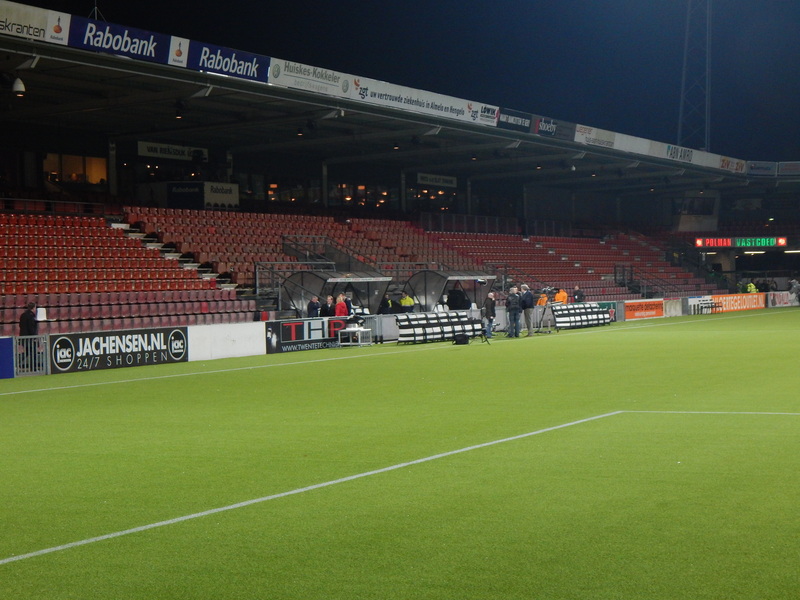 The club rented Kortenvoort’s Meadow on the condition that the owner’s son would be picked for the team! 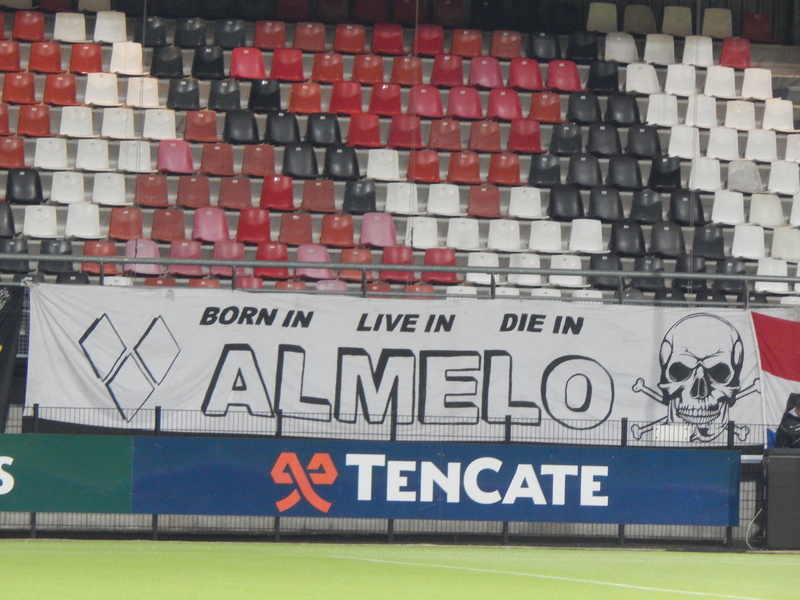 At the turn of the century Almelo already had a professional football team called Oranje Nassau, a club with exclusive membership to the bourgeois classes. They played on a ground in Wierdensche Straatweg and it was on this ground that Hollandia played their first ever match. The result against the professional team was unsurprisingly 23-0! It also transpired the dimensions of Kortenvoort’s Meadow was almost half the size of Oranje’s full size pitch. This was soon extended and because of it’s location on a hiking trail began to attract sizeable crowds. In May 1903 a meeting was staged at the Hotel Schreuder between the committees of Hollandia and another team, Inartie. The result was a merger and the birth of Heracles FC. Heracles moved to a ground called Bonthuis for the 1909-10 season and soon became Almelo’s premier team. Heracles even beat old foes Oranje Nassau 13-0 in that first season at Bonthuis. In 1910 the club adopted the present black and white striped shirts having previously sported black and green shirts. In 1913 the club were on the move again this time to Bornsestraat and the venue that was to become their home for the next 85 years. In July 1974 a decision was taken to separate the professional and amateur teams of the club in order to protect the finances of both entities and the professional wing was renamed SC Heracles ’74. The present name was adopted in 1998. The club has enjoyed sporadic periods of success including being crowed Dutch National Champions in 1927 and 1941, the competition has been known as the Eredivisie since the advent of professionalism in 1955. Having won the second tier Eerste Divisie in 2004/05, this modest club from eastern Netherlands have commendably spent ten straight seasons in the top flight. Their best performance in their current spell in the top flight has been a sixth place finish in 2009-10. Another memorable season came in 2011-12 when Heracles enjoyed a run to the KNVB Cup Final defeating VV Berkum, De Graafschap, RKC Waalwijk and AZ Alkmaar before succumbing to PSV Eindhoven by three goals to nil in the final in Rotterdam. Interestingly Heracles have a long history of employing English managers and to date seven Englishmen have led the team. Horace Colclough spent twelve years at Almelo between 1920 and 1932 and he was succeeded by Robert Roxburgh (1932-35). Then came Leslie Lievesley who coached Heracles in the 1946-47 season before joining Torino. Lievesley was subsequently killed in the fateful Superga air crash. Then came Michael Keeping who had been a coach at Real Madrid but was managing Poole Town when Heracles acquired his services for the 1960-61 campaign. Keith Spurgeon coached the club in 1963-64 and subsequently coached in the USA, Libya, Sweden and Cyprus. Les Talbot coached in the Netherlands between 1949 and 1972 and was at the helm of Heracles for the 1966-67 season before joining AZ Alkmaar. The final English coach of Heracles was Ron Dellow who similarly to Talbot spent 25 years in the Netherlands, three of which were at Heracles between 1972 and 1975, Dellow died in Almelo at the grand age of 99. 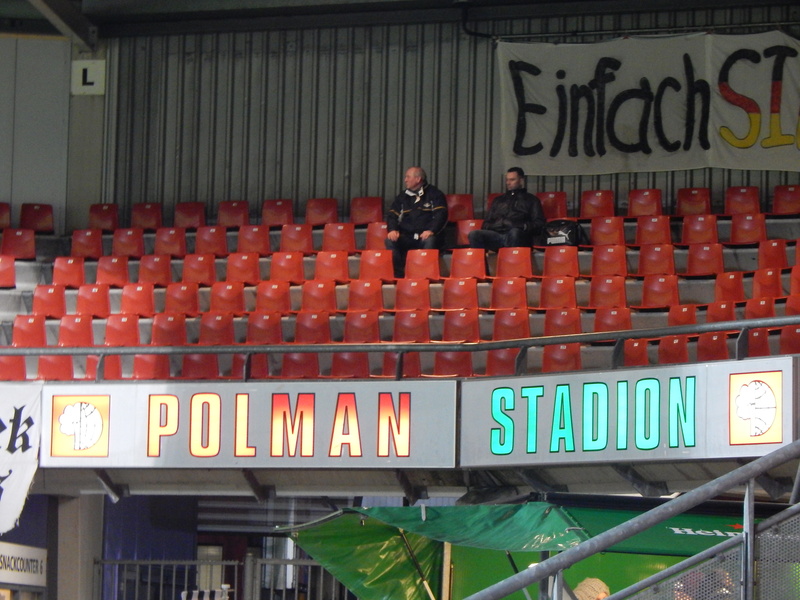 In June 1999 the club moved to the new Polman Stadion on the outskirts of the town. The old ground in Bornsestraat was largely demolished but thankfully the 1924 wooden grandstand, affectionately known as the “English Stand” was preserved and became part of the facility used by the amateur wing of the Heracles club, AVC Heracles. 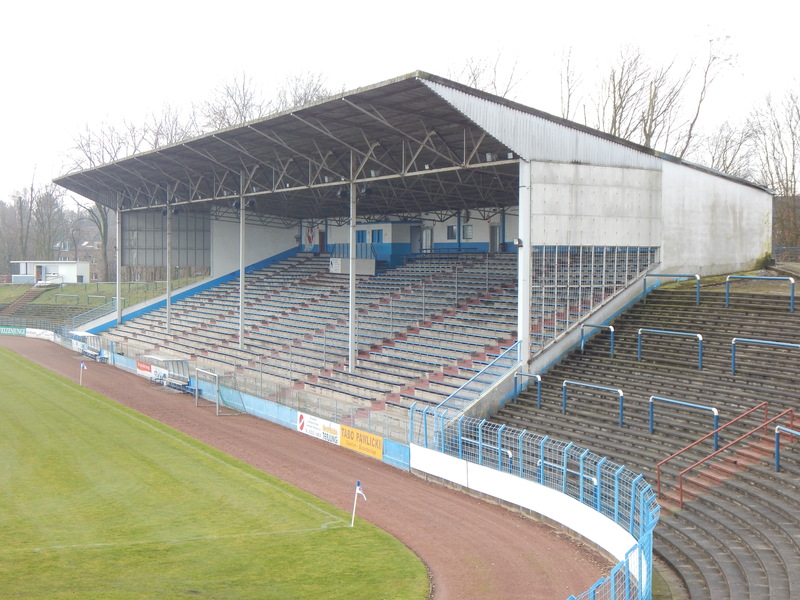 On July 14th 2011 the magnificent old stand was declared a national monument and as such cannot be demolished. Initially the new stadium had a modest capacity of 6,500 but due to promotion to the top flight at the end of the 2004/05 season this was increased by 2,000. 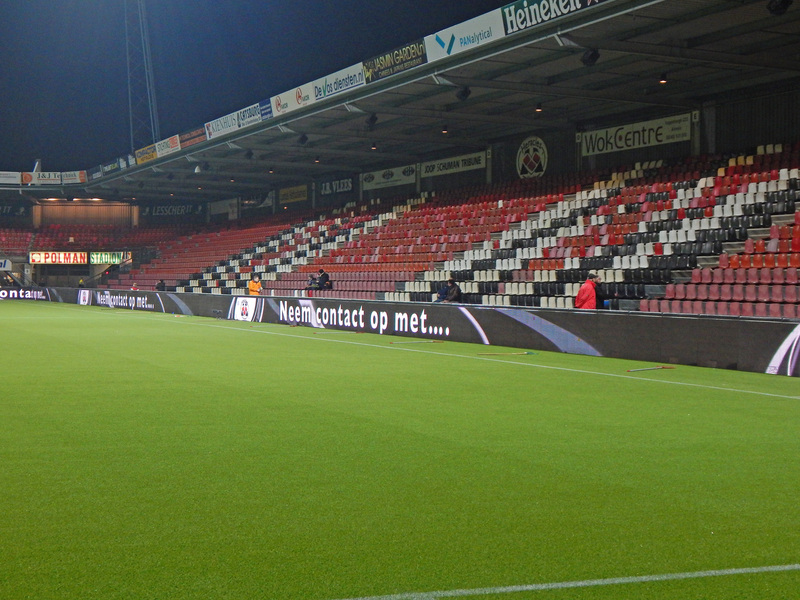 It remains one of the smallest stadiums in the Eredivisie and the club are actively looking at plans to increase the capacity to 12,500. Tonight’s game sees Heracles once again perilously close to the relegation places with only NAC Breda and Dordrecht below them in the table. 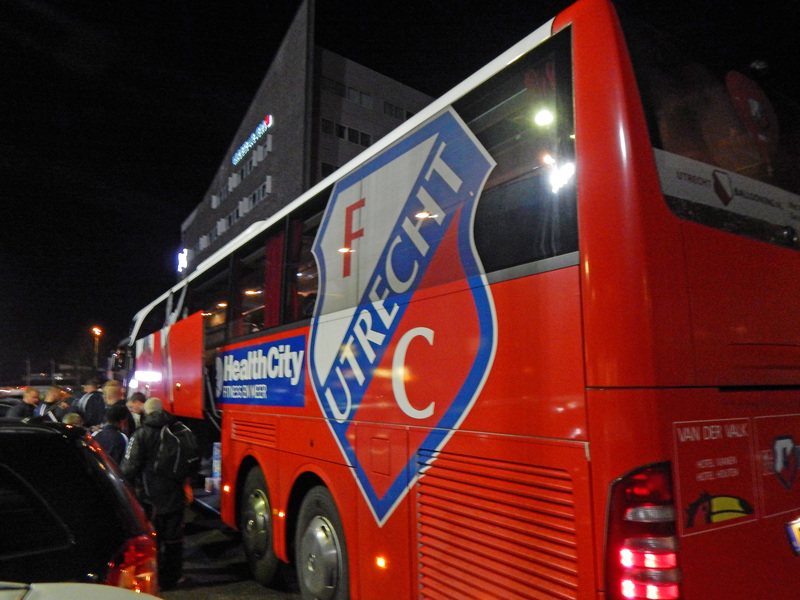 Visitors FC Utrecht are twelfth and only seven points ahead of their hosts. A win could prove vital for Heracles in their survival bid. 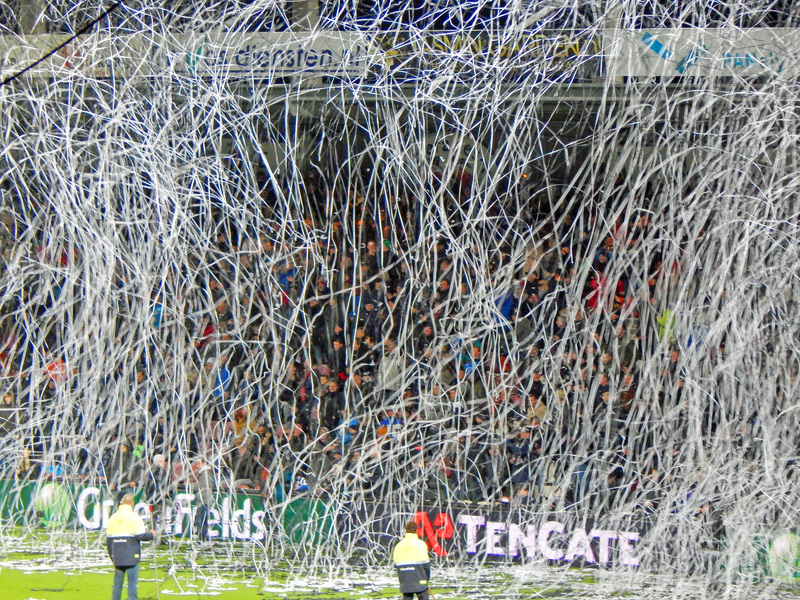 The game starts to a fantastic ticker tape display and some pyro from the small centre section of terracing behind the goal. The first half is low in quality with endless passing between the two teams seeming frightened to make a mistake. The game change with the introduction of the Swede Denni Advić. 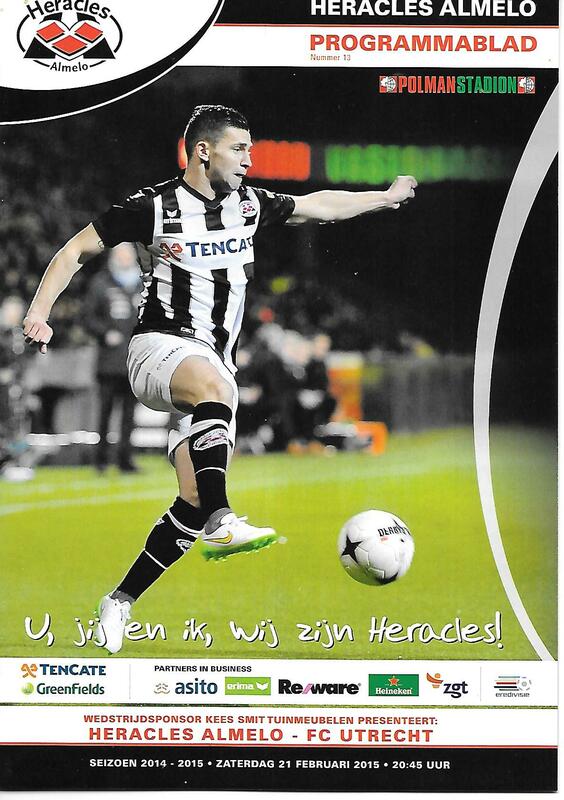 Within three minutes of his arrival he had scored and Heracles were in front much to the delight of the home crowd. However, this prompted Utrecht out of their shell and shortly after their French striker Sébastien Haller levelled the scores which in truth was a fair result with neither side doing enough to merit the victory. Sportclub Westfalia 04 e.V. Herne was formed in June 1904 by local factory worker Willi Stens who had been playing for the BV Steele club. He was elected as president and looked to friends from the area around the well to do neighbourhood of Schloss Strünkede to become the first team. The original Strünkede Castle was built in 1243 by the Lords of Strünkede who had been nobility since 1142. The current castle was completed in 1664 and provides a serene and stately backdrop to the huge open terrace opposite the grandstand. Westfalia Herne originally chose red and white stripes as their kit although this would be replaced by today’s strip of blue and white stripes in 1914. 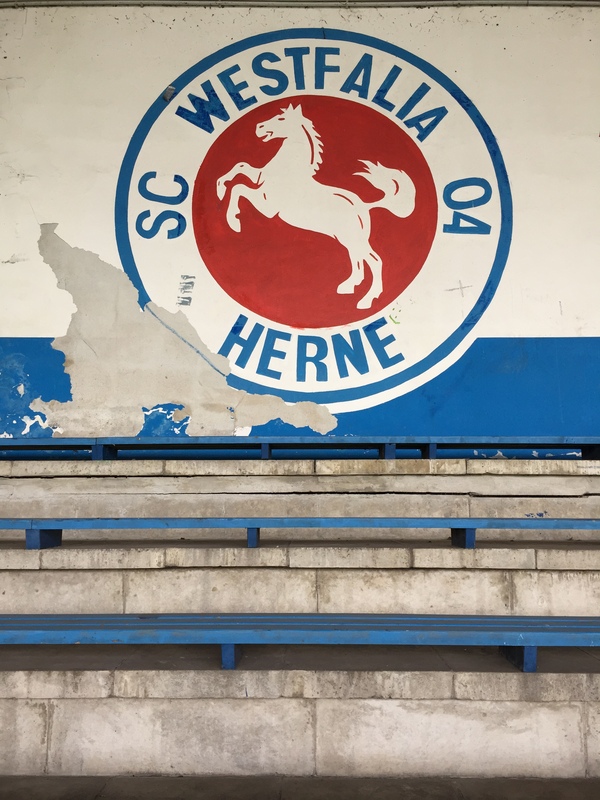 The industrial city of Herne soon became well served with competitive teams with Germania Herne being formed in 1909 and SV Sodingen some three years after that. This led to a number of well attended local derbies in the first few decades of the twentieth century. However disaster struck in 1923 with much of the Ruhr still being occupied buy the French, Westfalia Herne were officially dissolved. However, unknown to the occupying authorities the club carried on playing and in 1925 merged with Fortuna Herne and began “officially” competing again. The merger made the club very powerful and two straight promotions in 1929 and 1930 saw Herne rise to the top flight. In 1933 the club were placed in the Gauliga Westfalia as German football fell under the administration of the Third Reich. It soon became apparent that the meadow rented by Willi Stens had served its purpose and Westfalia Herne needed a home more suitable to their burgeoning support and status. The club opened their new stadium next to the Schloss Strünkede in 1934. Built on an audacious scale boasting a 40,000 capacity the new ground would welcome the likes of Schalke 04, Borussia Dortmund and VfB Bochum on a regular basis. 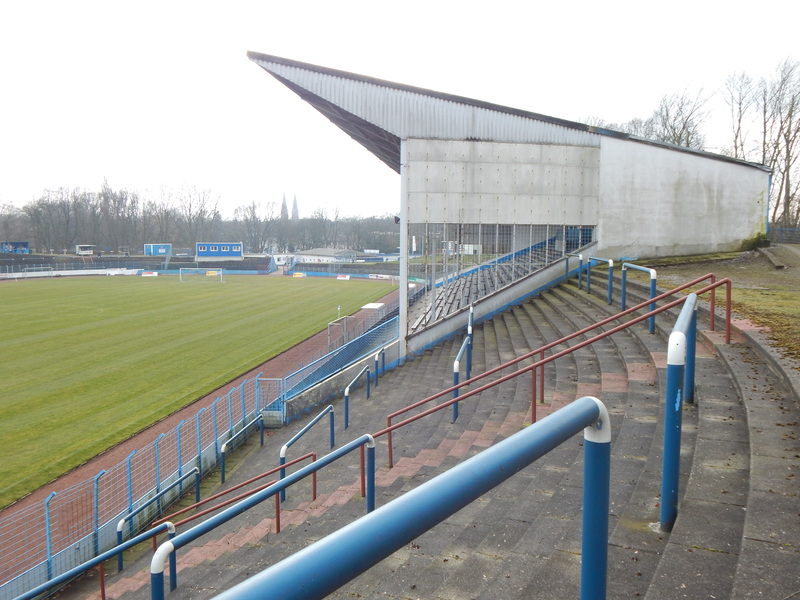 The Second World War became problematic for Westfalia Herne as the British commander in the Ruhr locked the club out of the stadium. 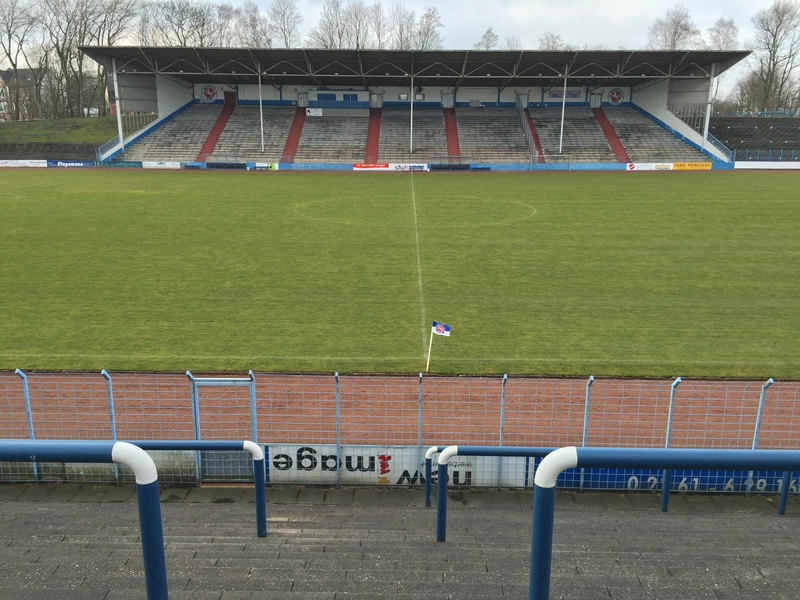 Club President Hermann Kracht held conservative views and after negotiations with the military a friendly between Westfalia Herne and the British troops saw the club allowed back into the stadium for good. 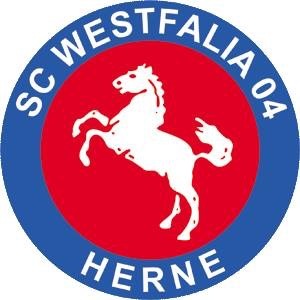 The 1940’s and 1950’s were a golden era for football in Herne with both Westfalia and SV Sodingen competing in the top flight for many seasons, unheard of outside of the major metropolises like Berlin, Munich and Hamburg. 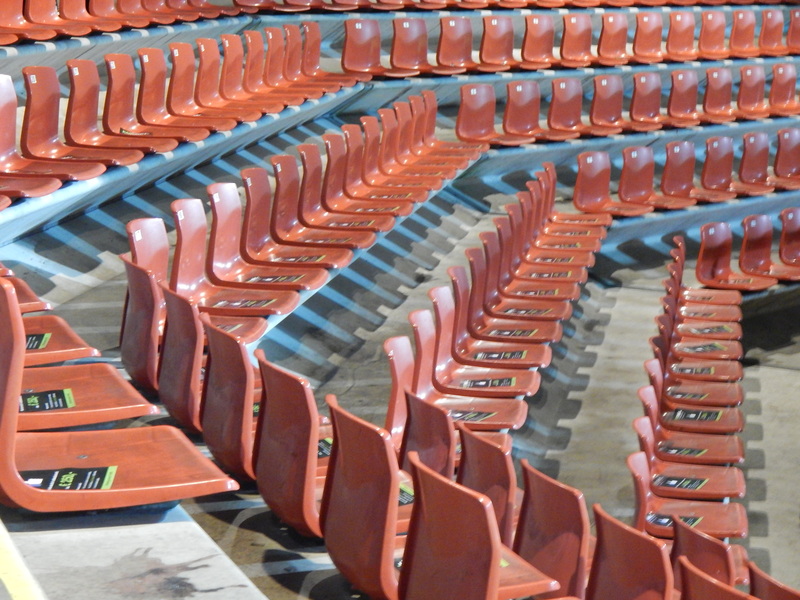 To celebrate their fiftieth anniversary in 1954 Westfalia Herne opened the newly built grandstand increasing the seated capacity at the Schloss Strünkede. In 1958 three Westfalia Herne players, Hans Tilkowski, Helmut Benthaus and Alfred Pyka played together in the same German national team. A year later under the guidance of Fritz Langner, Westfalia Herne became champions of the top flight Oberliga West. 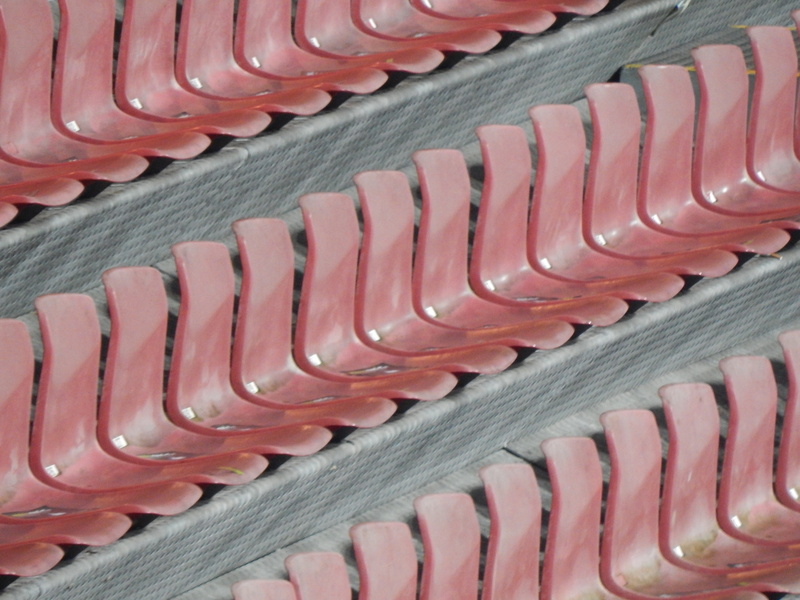 In May 1960 a crucial match against Hamburger SV saw an all time record 35,000 pack into the Herne stadium. Westfalia were runners up in the league the following season and despite consistent league performances the club missed out on election to the new Bundesliga in 1963. 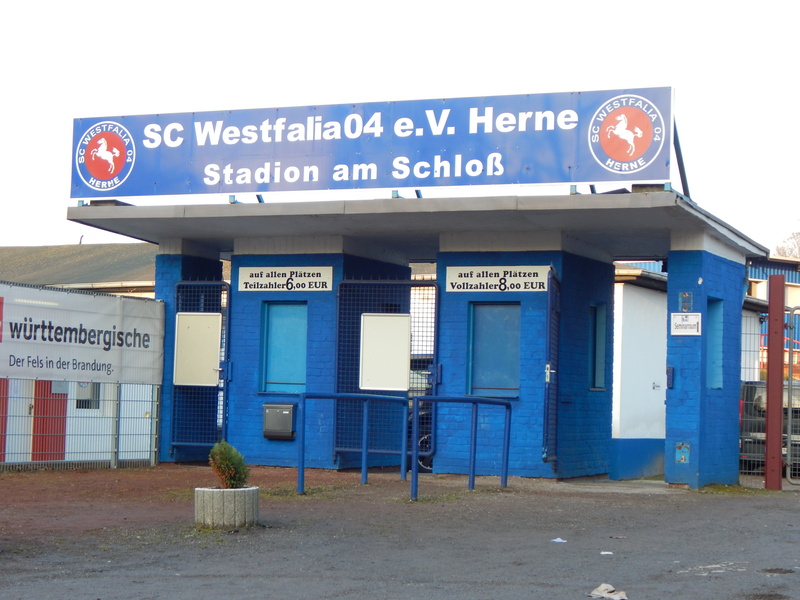 The advent of the new national league really spelt the end of the glory years for Herne football, Westfalia were relegated to the third tier and SV Sodingen slumped even further and currently play in the seventh tier Landesliga. 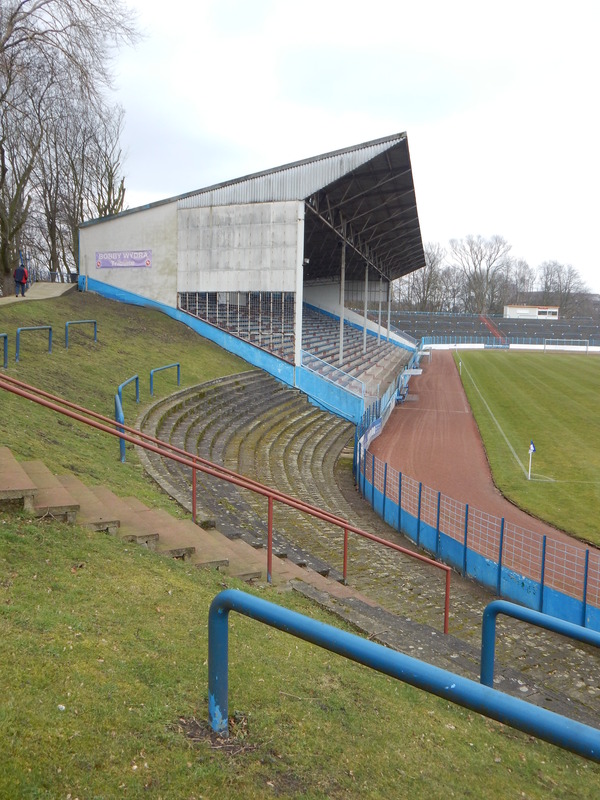 The 1970’s saw the club sponsored by the petroleum company Goldin, the stadium was renovated and Westfalia competed in the 2.Bundesliga-Nord. Four great years followed with well known players like Lutz Gerresheim, Jochen Abel or Sören Busk played for Herne. A famous 2-1 win over Borussia Dortmund was witnessed by 27,000 at the Schloss Strünkede. However disaster struck the club once again when the sponsor went bust and Herne pulled out of the league after just one game of the 1979/80 campaign. The club handed their professional licence back to the DFB and regrouped in the Amateur Westfalen Oberliga. Also in 1980 the club played a central part of the film “Theo Gegen den Rest Der Welt” where the lead character has a ticket for the (fictitious) DFB Pokal match between SC Westfalia Herne against Schalke 04 but has to miss the big game when his truck is stolen. This season has been a real struggle for this once mighty club. Competing in the fifth tier Oberliga Westfalia Herne have won just one of their fifteen league games and sit rock bottom of the table with just six points. Today’s visitors VfB Hüls are thirteenth in the 18 team division and Herne’s hopes of victory take a dramatic early blow. 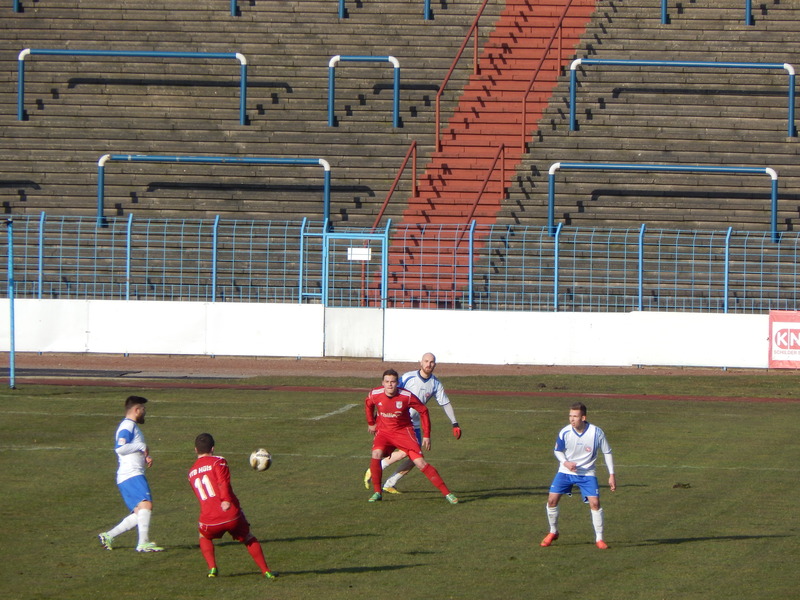 In just the third minute defender Yusuf Kilic handled a goal bound shot and despite him protesting his innocence he was shown a red card and Marko Onucka clinically despatched the penalty kick. Hüls doubled their lead before the break and despite Herne pulling one back after the restart with a penalty of their own in truth Herne were second best from start to finish. Today the magnificent Stadion am Schloss Strünkede echoed eerily with a crowd of around 400 (officially stated as 250) and the sixth tier trapdoor is well and truly open for this great club. 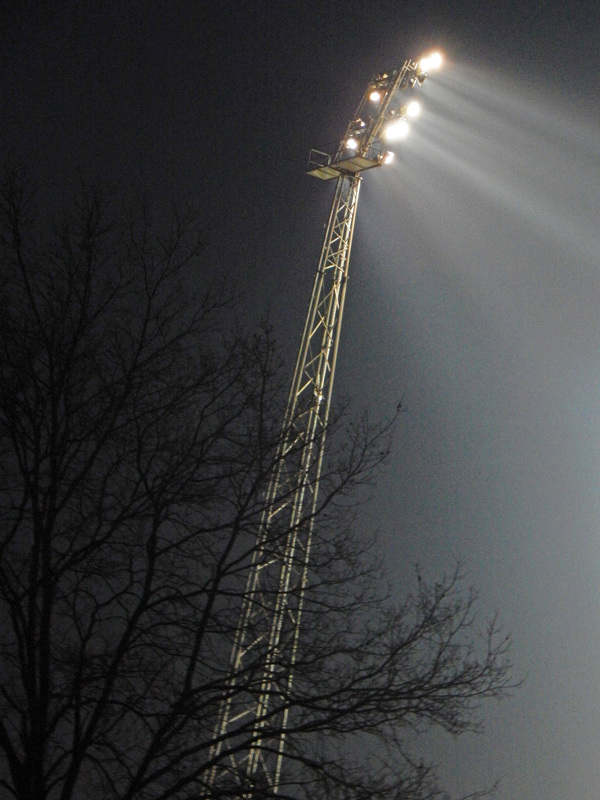 Despite their on field woes Herne still have their truly incredible ground, for me it’s a set of floodlights away from being the best ground I have ever visited. Just go there, they really do need the support. Sportsclub Preußen 1906 e.V. 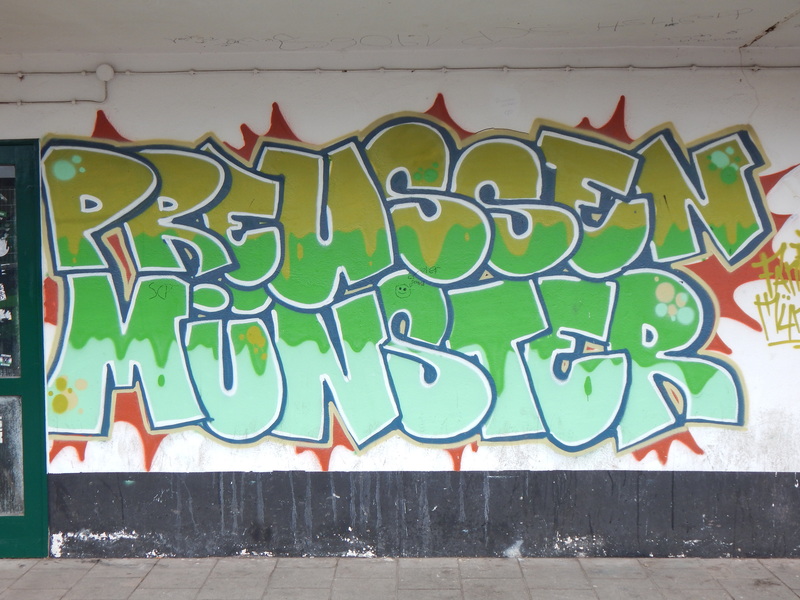 Münster started life in 1906 as FC Preußen, adopting the current name in 1921. The sports club which also fields teams in handball, tennis, athletics and fistball and was initially born in the Johann-Conrad-Schlaun Grammar School. 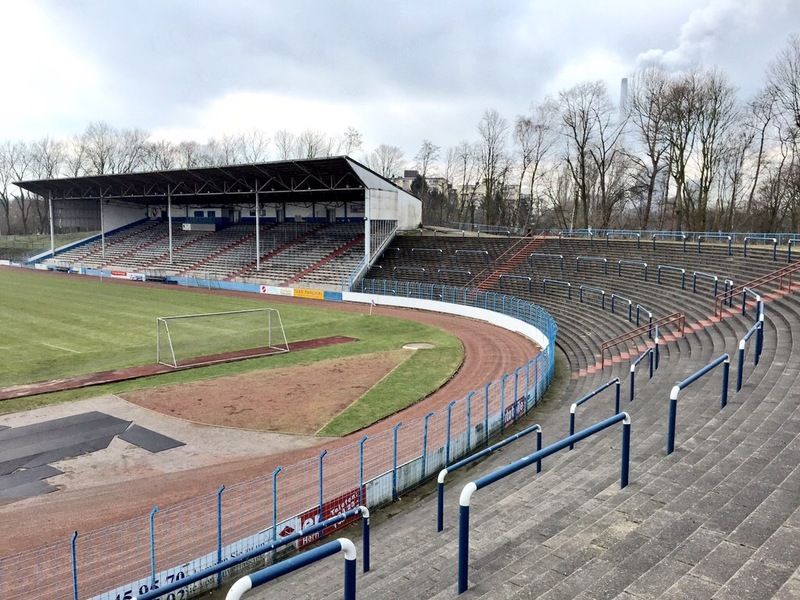 The club moved into the Preußenstadion in June 1926 and their new home initially boasted a capacity of 45,000. The record gate at the stadium however is put at 40,000 for a 1975/76 2.Bundesliga match against Borussia Dortmund which Münster won 4-1. 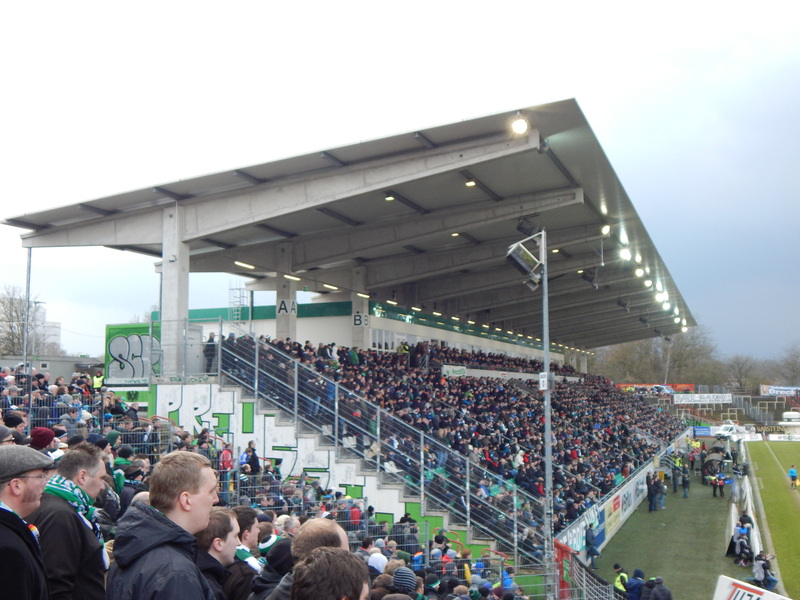 Nowadays, with modernisation to the main stand and limits placed on the terracing, the Preußenstadion now has a listed capacity of 15,050 of which 2,931 are seated accommodation. 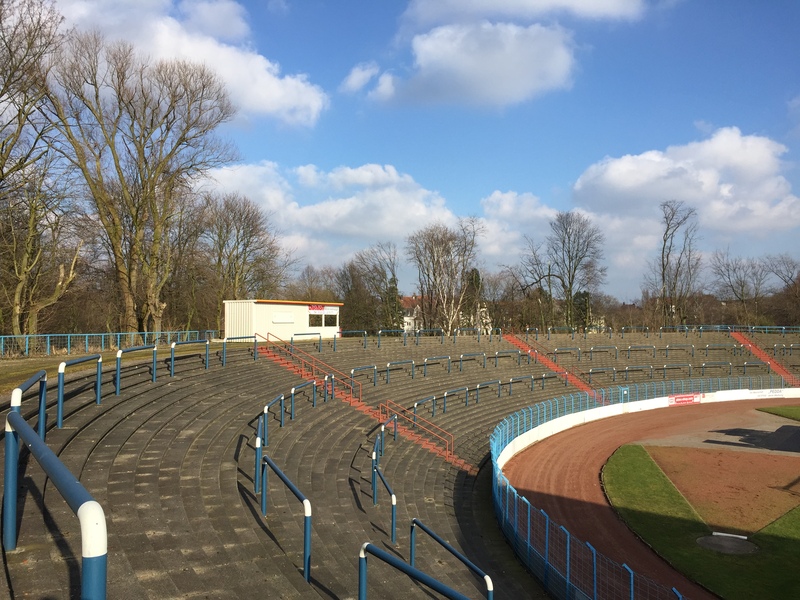 There were plans in recent years for a new stadium, dubbed the Preußen Park Arena, but instead the club has begun modernising the existing venue, new seats in the grandstand and roofs for the two terraces opposite. In 1933 when the Third Reich reorganised German regional football Preußen were placed in the Gauliga Westfalen but then suffered a period in the doldrums. The immediate post World War II proved to be a golden era for the club with the team returning to the top flight Oberliga West for 1948/49. The team boasted a front line known as the “Hundred-Thousand Mark Line” and featured the attacking quintet of Siegfried Rachuba, Adolf Preissler, Rudolf Schulz, Felix Gerritzen and Josef Lammers. 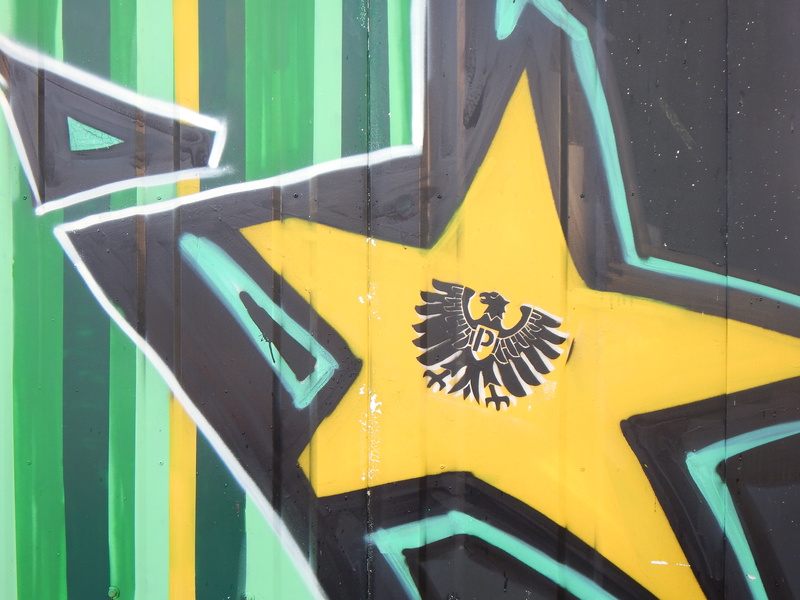 Gerritzen in particular was an idol of the Preußen fans and the curva where today’s ultras groups, the Deviants, gather is named in his honour. Gerritzen also played for VfB Oldenburg and Saxonia Münster and won four caps for the Nationalmannschaft. The team reached its peak in 1951 when Preußen reached the national championship final but lost 2-1 to Kaiserslautern in front of 107,000 people in the Berlin Olympiastadion. Their steady performances in the highly ranked Oberliga West saw them elected to the newly created Bundesliga in 1963. However, despite spending big, the club were relegated at the end of the new competitions inaugural season and as yet they have never returned to the top flight. 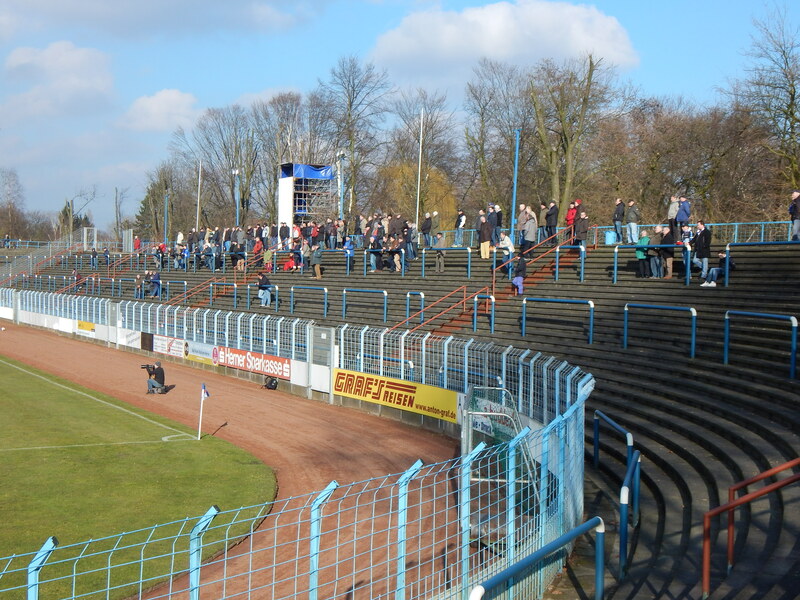 In truth the Bundesliga season led Preußen into two decades of financial trouble, tax fraud issues and a steady decline into the amateur Oberliga Westfalen III by 1981. Apart from two seasons in the 2.Bundesliga in the early 1990’s the club have mainly competed at the third tier. 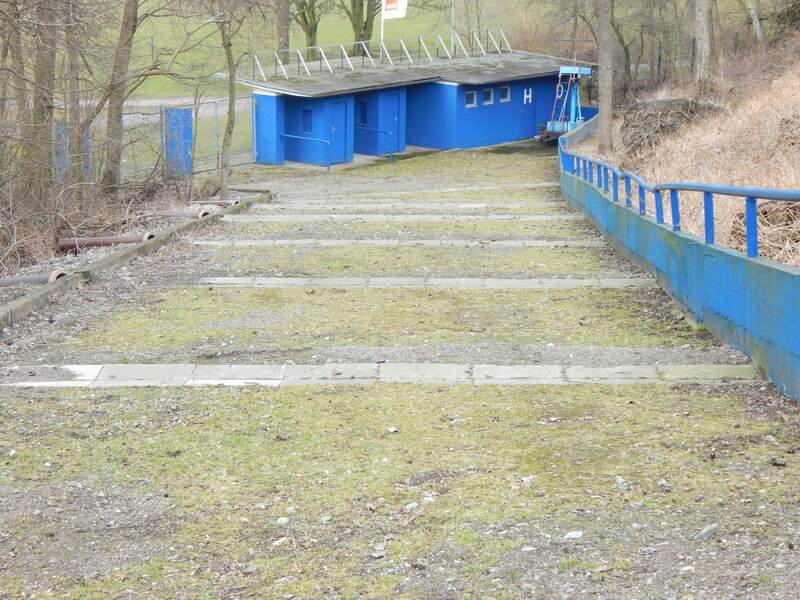 After relegation to the Oberliga Westfalen in 2006 the club again spent big to try and regain third tier status but the plan failed. 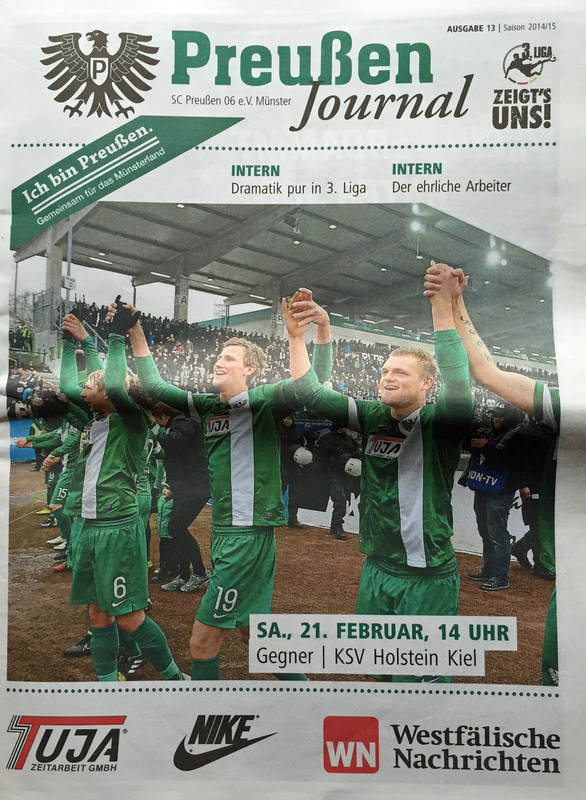 The following season youngsters replaced the highly paid veterans and Preußen stormed to the Oberliga title. 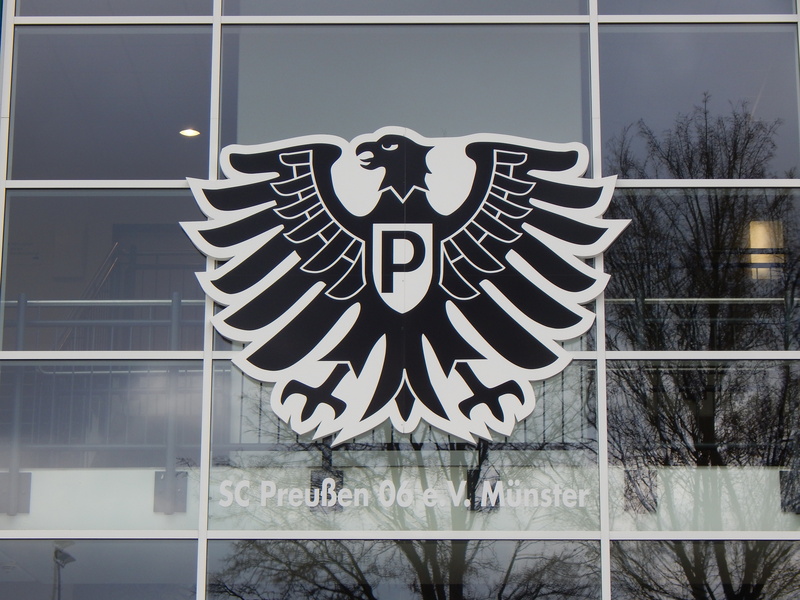 This season has so far proven to be Preußen’s most successful in some time, the club going into today’s game sitting in second place, four points behind one of their biggest rivals, Arminia Bielefeld. 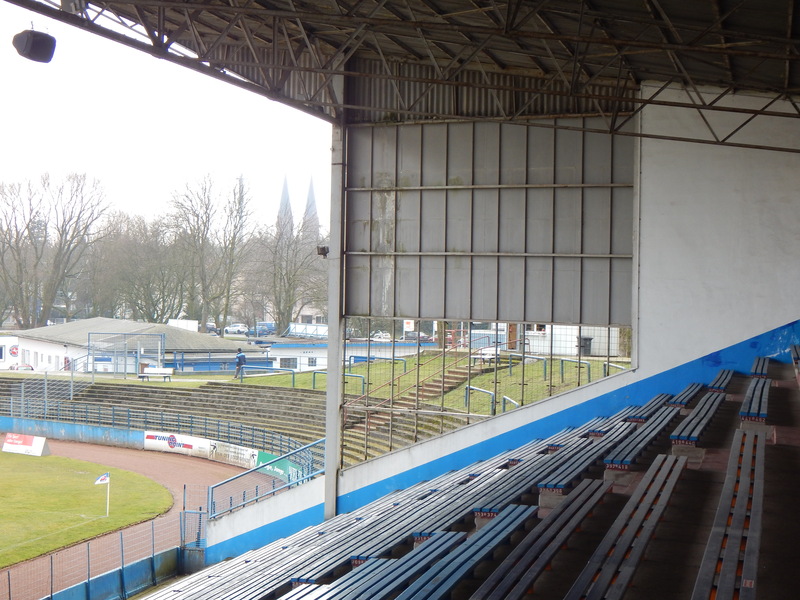 Today’s visitors, Holstein Kiel, are also in contention for promotion five points behind Preußen in sixth place. 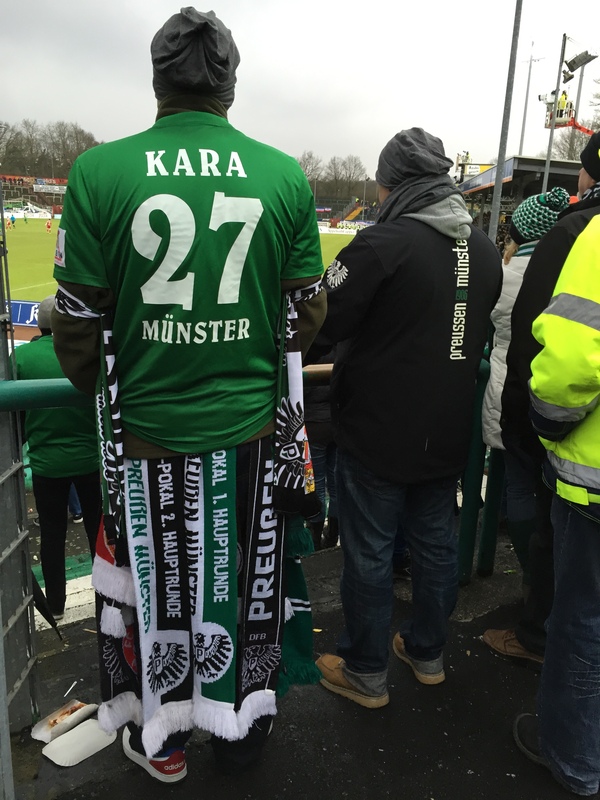 The form table initially went to plan when Preußen’s Turkish striker Mehmet Kara sent the ultras into frenzy with the opening goal in the 35th minute. 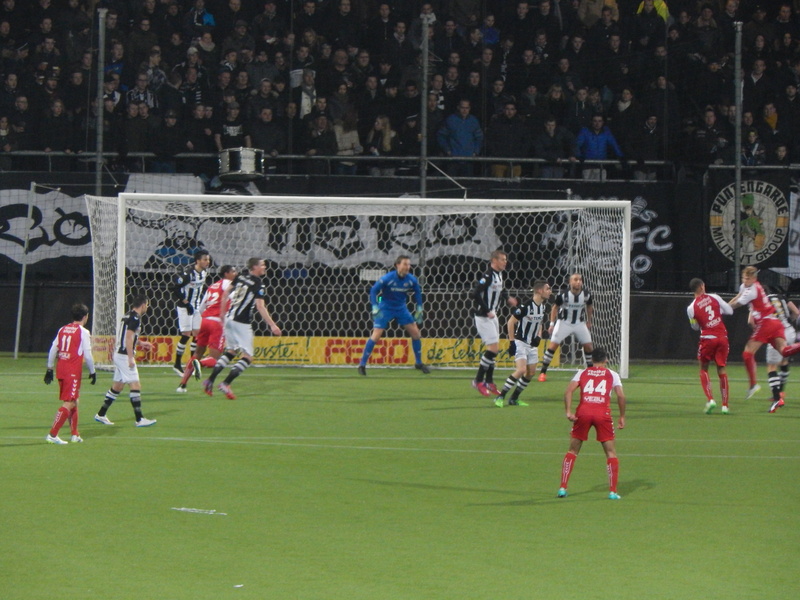 However, Kiel had not read the script and a two goal salvo just before the break proved decisive. 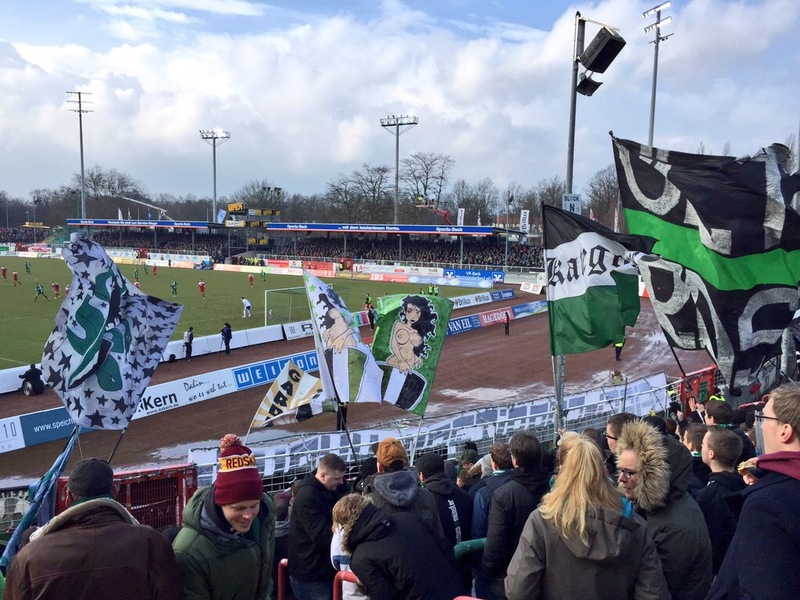 A second goal for Kiel’s Rafael Kiazor midway through the second half was the coup-de-grace and the green and black clad home fans soon headed for an early exit. 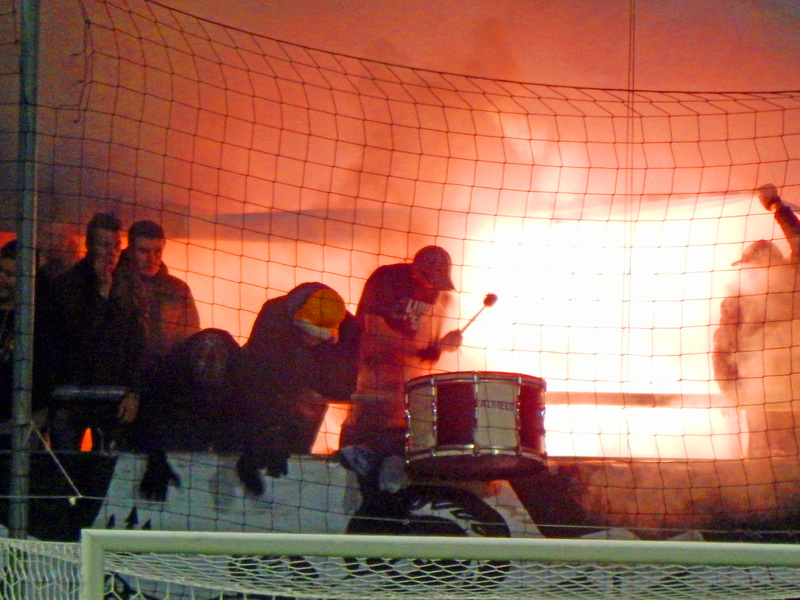 Until the third goal went in the support of the ultras in the Gerritzen end was superb. 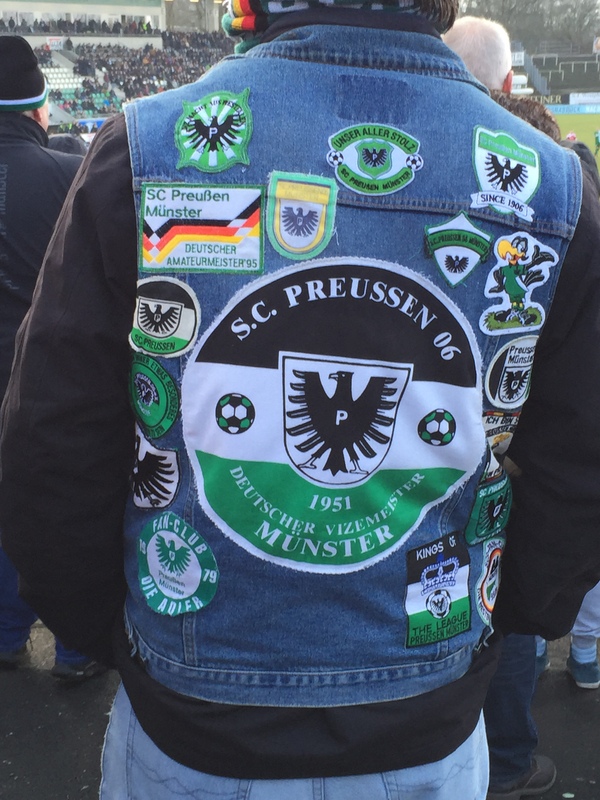 Noisy, colourful and relentless they certainly made my trip to the excellent Preußenstadion a visit to remember.